Yes! Send me free media & public speaking tips! For so many of us who rely on our phones to get work done on deadline, Apple’s iOS text glitch was much more than an inconvenience; it was a lesson in what happens when we are unable to communicate effectively. Where were you when the iOS bug hit? I was in a Southwest Airlines plane sitting on the tarmac at MDW waiting for my flight to take off to Philly. It was 10:15 Sunday night. We were late, waiting for three passengers connecting from another flight. There were delays all day because of tornadoes and other weather across the U.S. I was swamped with client work. At this point, I’d be at my hotel by 3am. I needed to be up at 7am to get to the Philadelphia suburbs by 9am. Four hours of sleep was ahead of me. It was like I was back producing morning shows. I needed to get as much done as I could on that flight. I wrote a few posts for clients. Then, I posted a quick video on my company’s FB page. I couldn’t make it stop. I couldn’t make it stop….. I gave up and took a nap. My messages wouldn’t get through that night. The night I couldn’t communicate. 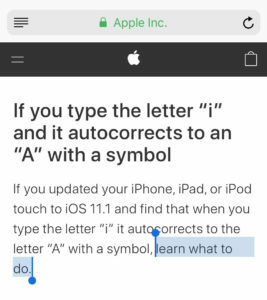 Apple users with devices running iOS 11.1 are finding that typing the letter “I” autocorrects to an “A” with a unicode [?] symbol instead. Apple says the bug is affecting devices including the iPhone, iPad or iPod touch that have updated to iOS 11.1. Not all users have been affected by the bug. In the meantime, Apple describes a workaround through its Text Replacement feature. If you’re suffering from this bug and want to use this temporary fix, go to the Settings menu, tap General, then Keyboard, and finally tap Text Replacement. 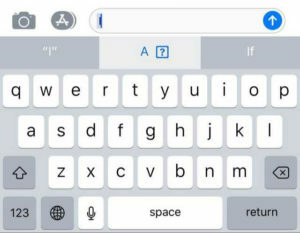 Touch the “+” symbol then in the Phrase option type “I” and in Shortcut, type a lowercase “i.” It’s a fiddly “fix” that brings new variability to the ever useful Apple meme of You’re [insert verb] it wrong. Kathryn Janicek is a three-time Emmy Award-winning television producer with 20 years of experience working in newsrooms across the country. Kathryn coached talent, producers, and writers before switching her focus on helping entrepreneurs and corporate executives. 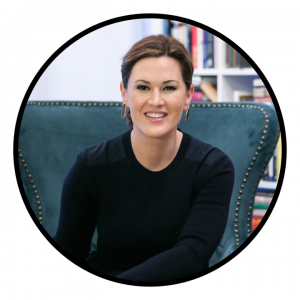 Now, based in her home city of Chicago, she is a much sought-after media coach and public speaking trainer who will help you produce the best YOU. Click HERE now to book a complimentary 30-minute consultation with Kathryn!